Rack Cards is rated 4.9 out of 5 by 18. Rated 5 out of 5 by ed1963 from Rack Cards Very satisfied with the rack cards. Easy to put together and submit an order. Rated 5 out of 5 by Circle of Friends Inc from Quick and Affordable I found this website looking for some quality rack cards. I supplied my own artwork, played with the dimensions to get it just right. I was able to review before I paid for the items. I do wish that the customer service department would have called to let me know about a shadow that appeared on one of the stock photos prior to it going out. Nevertheless, this is a very efficient way to attract customers by advertising. Rated 5 out of 5 by Tersa from The graphics and quality were top notch! My salon menus are outstanding. 48 hour print will not disappoint! Very professional. Rated 5 out of 5 by LindaD from Needed rack card ASAP! Easy upload, quick turnaround, great price! Highly recommend. Rack card printing delivers tourists and travelers to your door! Rack card printing is a proven travel and tourism promotional tool. At 48HourPrint.com we print high quality rack cards that come with our industry-leading 48 Hour Turnaround Guarantee. Place rack cards in hotel lobbies, highway rest stops, local tourism offices, at rental car counters, and anywhere else tourists turn for information. To make sure your rack cards stand out from those of your competitors, we print on high quality card stock and offer a free matte or gloss coating. There are many ways to promote your business with rack cards. Make the rack cards into coupons that can be redeemed for discounts or free items. Include useful information such as directions to your business, a phone number, and your website. Highlight other information pertaining to your business or industry so customers hold on to the card as a reference. In addition to rack card printing, brochure printing can be a great way to provide more detailed information about your business to those who are interested. Also consider creating other keepsakes like bookmarks or bumper stickers for travel agencies and tourism offices to make available to potential customers. 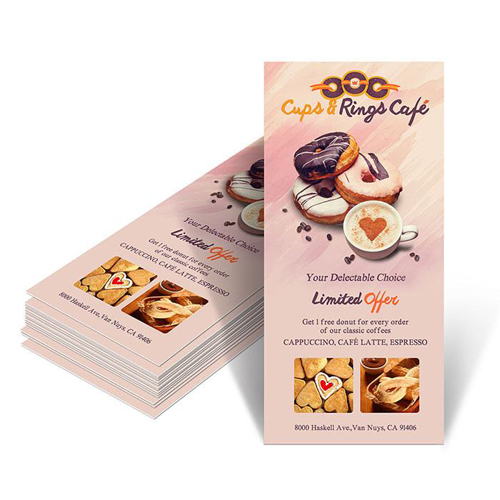 For promotional tips on using rack cards, check out our rack card marketing ideas. Also review our rack card templates for layout guidelines that make for an easy design and printing process.